Heat 2 tablespoons ghee in a deep non-stick pan. Add cashewnuts and raisins and fry till light golden in colour. Drain on absorbent paper. Add ada the ghee remaining in the pan and sauté till light golden brown in colour. Add 1 cup water and mix. Cook for 2-3 minutes. Add thin coconut milk and mix well. Cover and cook for 8-10 minutes or till the ada is soft taking care not to mash it. Add jaggery, mix well and continue cooking till the jaggery dissolves and the mixture thickens. Add thick coconut milk and mix. Reserve a few cashewnuts and raisins for garnish and add the rest to the pan. Stir well and heat through without boiling the mixture. Transfer into a serving bowls. 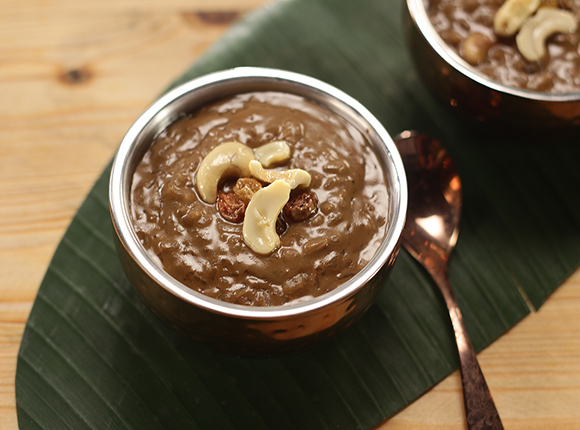 Garnish with remaining fried cashewnuts and raisins and serve hot.